In the previous post I wrote about my sledding adventure, which in the end didn't include that much sledding. I have mentioned that we went to Vogar. What I didn't mention is that it's in the Slovenian region of Gorenjska. 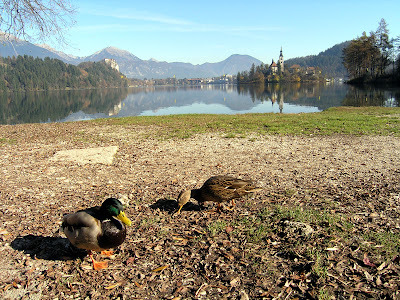 On our way from Ljubljana we drove past a couple of lakes - Bled and Bohinj. One part of Lake Bohinj can be visible on a photo included in the previous post. 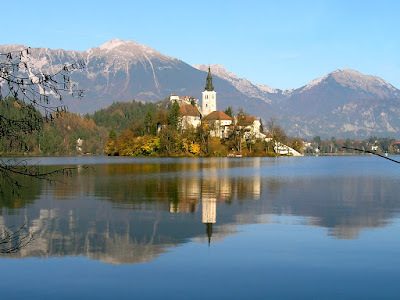 This time we didn't have time to stop and admire the beauty of Lake Bled which is the most promoted tourist sight of Slovenia - and with a reason too. It's breathtaking. 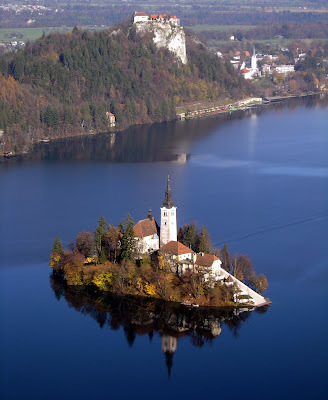 In the middle of the lake there is a church build on the only Slovenian island. 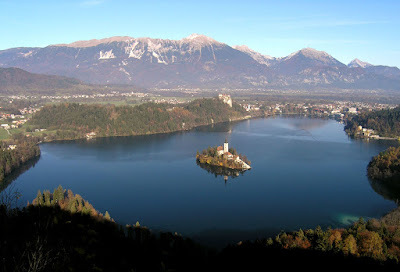 On a steep cliff rising almost directly from the lake stands the oldest Slovenian castle. It was first mentioned in 1011. Even a former Yugoslav leader, Marshall Tito had a residence by the lake. In short: it's a must see. During the last autumn me and my girlfriend took a trip there. It is a great destination for a day trip. The objectives were simple: to relax, enjoy the scenery and of course to take some picture-postcard photos.